Only four counties have a disposable income ahead of the national average. The figures come from CSO analysis of incomes in 2014. ONLY FOUR COUNTIES in the Republic of Ireland have a disposable income per person greater than the State’s average. Those counties are Dublin, Limerick, Cork, and Kildare. The results are contained in figures released by the Central Statistics Office for the year of 2014 and also show that the gap between Dublin as the richest region and the border region as the poorest has widened over the past number of years. Disposable income includes primary income plus social welfare payments minus taxes and social insurance contributions. On a per person basis, the disposal income in Dublin comes to €21,963 compared to a nationwide average of €19,178. 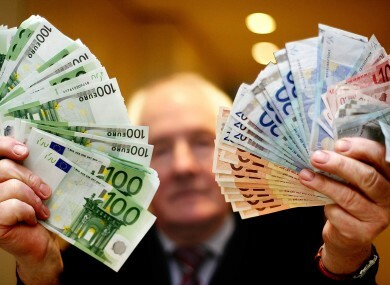 Limerick’s is the second highest at €20,395, ahead of Kildare at €19,385 and Cork at €19,234. The counties with the greatest deductions from their primary incomes include those four counties as well as Meath, Wicklow, Kilkenny and Galway. Donegal has the lowest average disposable income at €15,061, with the counties of Roscommon (€16,281), Monaghan (€16,395) and Offaly (€16,460) just above that. As is evident from that list, the border region has the lowest disposable income on a regional basis with an average of €16,601. It means that the gap between the border region and Dublin now stands at €5,362, almost €800 more than was the difference in the previous year. The CSO also notes that the gap between Dublin and rest of the regions decreased during the period of peak austerity but has since widened again. “Viewed from this longer term perspective (from 2006 onwards) the divergence in income between the regions and Dublin was at its lowest in 2010 but has continued to widen in 2011, 2012 2013 and 2014,” the CSO states. Email “These are the four richest counties in Ireland ”. Feedback on “These are the four richest counties in Ireland ”.